A robot that teaches physiotherapy and conveys doctors' instructions to a patient might be the face of eldercare in future. German technology company TUV SUD has developed such smart healthcare solutions that can help the elderly age in place instead of constantly visiting hospitals. The company officially launched its Smart Elderly Care @ Home Centre yesterday at its headquarters in Science Park Drive. The centre provides a platform for the company to test the safety, security and reliability of its products. "Countries like Singapore have limited resources in healthcare, so we have to leverage technology to care for the aged in our society," said Dr Axel Stepken, the chairman of TUV SUD's management board. For example, a robot the company has developed has a camera that doctors can use to "see" a patient in his home and check if he is taking the correct medication. "Doctors can also use the robot to "talk" to the patient and convey medical advice. The robot can even teach patients how to do physiotherapy. This reduces the need for patients to go to hospitals for rehabilitation exercises, for example, and allows them to receive healthcare at home, said the company. TUV SUD has also developed a network of sensors and screens that enables doctors to monitor the vital signs of patients remotely. Senior Minister of State for Health, and the Environment and Water Resources Amy Khor officiated at the launch of the centre. "We want to help our elderly age in place, and with peace of mind, surrounded by their loved ones," she said. Such healthcare technologies come in the wake of the Smart Health Video Consultation and Smart Health TeleRehab. Both systems were launched this year by Integrated Health Information Systems, the health technology agency for the Ministry of Health. They allow patients to use video consultation or carry out rehabilitation exercises at home. However, there might be challenges, such as getting the elderly to accept such technology. TUV SUD digital service director Andreas Hauser said: "I think it's about explaining the benefits to them and how it can enable them to stay at home to recover." He added that the technologies will continue to be developed in the next year before being rolled out to interested healthcare providers and tested in real-life scenarios. Senior homecare physician Tan Jit Seng said such technology would greatly benefit caregivers. He is also the director of home healthcare service Lotus Eldercare. 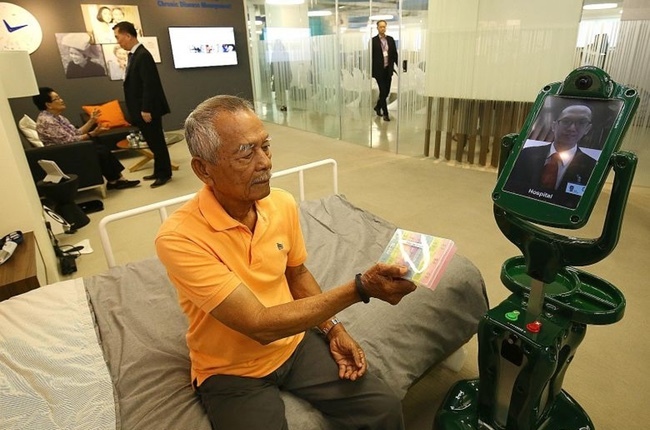 He added: "The robot helps patients and caregivers feel there is always a doctor there if they need one. It takes the strain off our manpower resources as well as the caregivers."